Using only the highest quality RG400 cable, the SMA Female Reverse Polarity Bulkhead to N Female Bulkhead is constructed using Fluorinated Ethylene Propylene (FEP) jacket cable. and maintain a VSWR 6GHz. 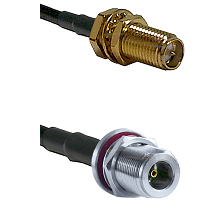 The RPSMAFBH-RG400-NFBH-Length SMA Reverse Polarity Female Bulkhead RG400 Cable Assemblies is precision assembled using RF and Microwave components.